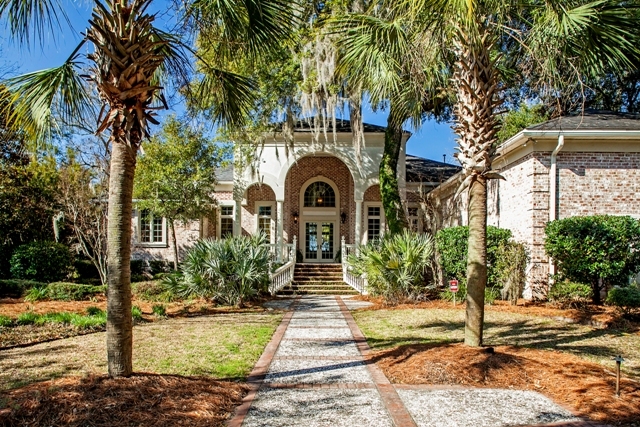 Tucked away in the upscale Johns Island neighborhood of Gift Plantation, 4036 Gift Boulevard offers an elegant interior and waterfront living at its finest. Palms, mature trees and lush landscaping enhance the home’s dramatic entrance which is accented by a covered porch and delicate glass doors looking through the home to the water. 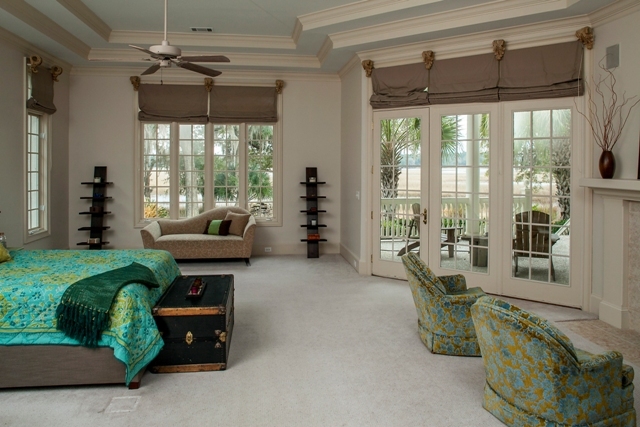 You will also find the master suite at 4036 gift Boulevard downstairs. This refined space faces the water and has access to the back piazza. Wake up and enjoy the waterfront views from bed or step outside to enjoy the cool breezes and coastal sounds coming from the water. A warm fireplace makes the room cozy and his and her walk-in closets provide plenty of room for your belongings. The en suite master bath is as equally stunning as the bedroom with a tray ceiling, dramatic columns, dual vanities and a skylight to allow the natural light to filter into the space. The other two bedroom suites are located upstairs. 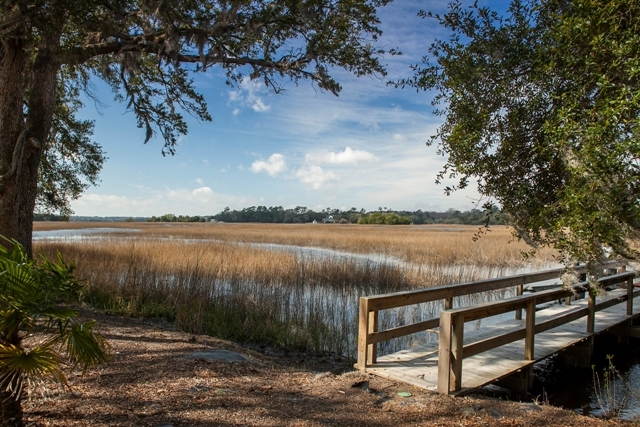 Charleston is known for its beautiful marshes and waterways along with its temperate climate. With that in mind, this house was built to make the most of its location with abundant outdoor living spaces that face the water. The large 1-acre+ lot has been expertly landscaped and the backyard has many attractive “bonus” features including a putting green, a pergola, two waterfall features and a brick fire pit for those crisp fall evenings. 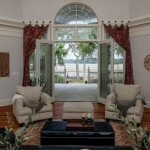 The back piazza is accessible from many rooms within the home and offers unobstructed views of the water. Tall, two-story ceilings provide cover so the space can be enjoyed even when it is raining and detailed columns and arches add visual interest to the space. For those who like boating, you will enjoy the very short dock with a boat lift which is nestled in the tidal creek to make exploring the surrounding rivers, creeks and oceans a breeze. In addition to these worthy features, the Gift Plantation neighborhood also has a host of attractive amenities to offer residents including tennis courts, a neighborhood pool, an owner’s clubhouse, a community deep water dock and walking trails throughout the neighborhood. 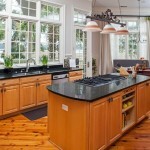 Its location is also desirable–just a short drive to downtown Charleston and the beaches. Contact listing agent Melissa Martin for more information.